After getting to the office two hours early, powering through five meetings, going home to let your dog out during lunch, cranking out endless work during the afternoon, running a number of errands once you’ve managed to escape the office and somehow finding the time to exercise — not to mention making dinner before you fall asleep to do it all over again — predictably, you’ve found yourself absolutely exhausted. That’s quite a bit of activity for one day, and now your mind and body are paying the price. 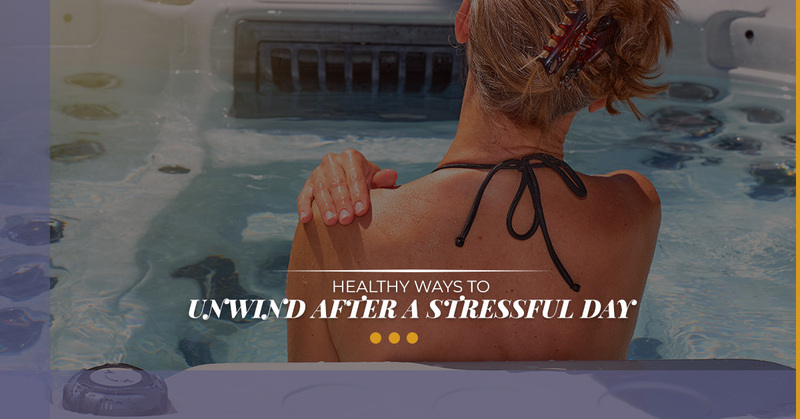 If you’ve found this description of the average American workday to be all-too-relatable, find solace in the fact that Spa Hearth & Home, your go-to New Jersey Bullfrog hot tub dealers, can help you relax and unwind. There are virtually an infinite number of ways that people can choose to decompress post-work or even post-school (if you’re a teacher, you have the best of both worlds), but the truth is that everyone has their preferred modality of R&R. Though we’re a little biased, we encourage those who have never soaked in a Bullfrog hot tub after a long, stressful day to do so. Not only is the experience sure to soothe your aching muscles and relieve tension in the body, but it’s also meditative, helping to quiet your racing mind. The best part? It’s incredibly easy. Simply slide off the cover of your hot tub after it’s been heating up, run the jets, and dip inside. The experience is truly a no-brainer, and that’s probably very important when you’re reduced to no brain after the end of a long, hard day. Below, our Bullfrog home spa dealers in Maple Shade offer some healthy, valuable ways to kick up your feet and take it easy when you need it the most. Feel free to contact us should you have any questions! You can also visit this article in which we cover Bullfrog hot tub benefits in greater depth. First things first: don’t take any of your work home with you. It’s going to be nearly impossible to relax and achieve anywhere close to a zen-like state without separating work from home. Sure, you had homework in school, but unless you’re currently a student pursuing higher education, don’t check your work email (or do anything else work-related) at home. Even if it means simply putting your phone on airplane mode, turning your ear away from the outside world and frenzy of information on the internet is bound to do your mind some good when it’s already stuffed with so many thoughts. Social media and networking services are useful tools, but they’re also easy ways to stimulate your already overcrowded brain. Consider reading a book, taking a calming bath, or sipping a hot cup of relaxing herbal tea out on your porch instead. If you must be entertained by Netflix or Hulu, at least put your phone away so you’re still a little disconnected from others. Why not? Essential oil diffusers are easy to use and, while we’re not saying that essential oils are going to save you from a life-threatening illness, they can help alleviate various stressors in your life. Plus, at the very least, they smell nice. There are many different essential oil brands with many different oils to choose from, so hit up a retail store and smell different samples to decide what you like. Lavender is a great example of an essential oil that is said to help relax and quiet the mind, prompting you to go to sleep. Some pillow covers are even designed to work in tandem with essential oils like lavender. If you’re not excited to return back to an empty, dreary apartment after work, then you’re more inclined to work overtime or stay out hitting up a bar or two before you’ve actually returned home to fall asleep. By personalizing your living area and bedroom with things that you like — encouraging your mind to enter a zen-like state where the stresses of work and life aren’t there to affect you — you’re more likely to leave work right on the dot in order to spend more time doing your thing at home. It’s no secret that exercise is one of the primary components of a happy and healthy lifestyle. When you exercise in your day-to-day life doesn’t necessarily matter as much as just doing it in the first place; you may be surprised at how much endorphins can improve your mood. Even if you’re simply walking your dog down the block or hitting the gym for a quick weightlifting session early in the morning, trust us when we say that you’re doing your mental and physical health a favor. As an adult, you’re free to do what you want, of course. However, steering clear of these substances whenever possible is not only healthier for your body, but it’s also better for your mind and steering clear of worsening any pre-existing anxiety.